SINCAN, TURKEY. 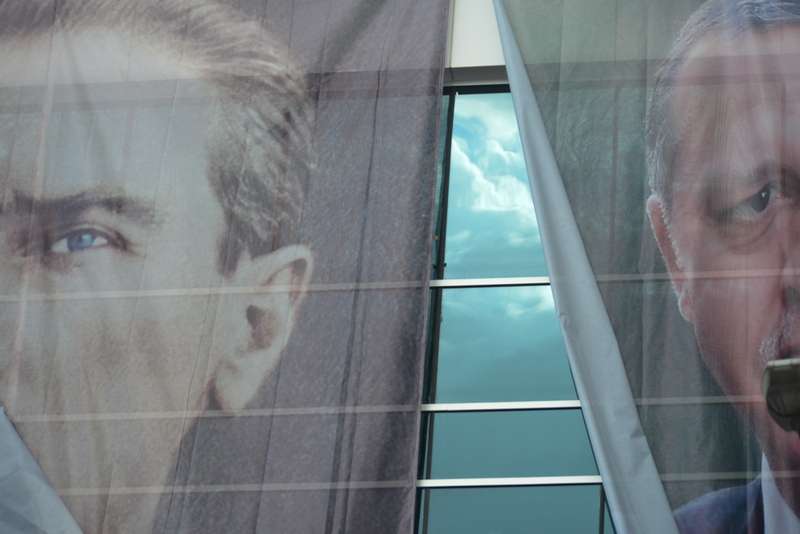 Posters of Mustafa Kemal Ataturk, the founder of Turkey's secular republic, and Turkish Prime Minister Erdogan are seen adorning the facade of a building in Kent Square during a Justice and Development Party, AKP, rally where Prime Minister Recep Tayyip Erdogan was to speak after more than two weeks straight of protests across Turkey against his rule on June 15, 2013. Sincan is the site of the 1997 "post-modern coup" and where Turkish Prime Minister Recep Tayyip Erdogan chose for his Ankara rally to bolster his position with regard to ongoing protests in Istanbul's Taksim Square and across Turkey; at his rally he said that the security services would promptly take care of the protesters and shortly after riot police were unleashed on the peacefully gathered demonstrators who quickly retook the square.